Gaining recent popularity due to his appearance in the 2014 Guardians of the Galaxy film, Drax the Destroyer has various origin stories, but one thing holds true throughout. He is hell-bent on seeking vengeance for atrocities committed against his family, no matter the cost. 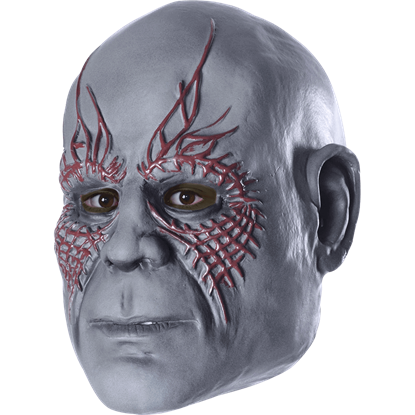 For those aspiring to portray this avenging alien, Superheroes Direct offers a variety of masks and costumes for both adults and children featuring his gray skin and distinct red markings from the 2014 film. 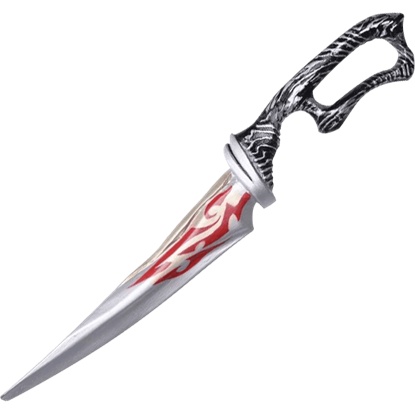 Make sure to complete your transformation with our replica Drax the Destroyer dagger. Our POP figures, accessories, drinkware, and t-shirts featuring Drax along with his friends are the perfect collectibles or gifts for any fan of Drax the Destroyer and the Guardians of the Galaxy film. Do you feel your anger burn against Ronan the Accuser after seeing the Guardians of the Galaxy movie? Then you may enjoy dressing in the Adult Deluxe Drax the Destroyer Costume and role-playing your vengeance this Halloween! Make vengeance against Ronan the Accuser your target when you dress as Drax the Destroyer this Halloween! 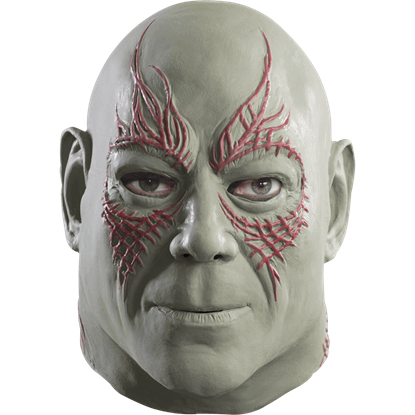 The Adult Deluxe Drax the Destroyer Mask allows you to create an authentic look like the character from the movie. Do you long for vengeance against Ronan the Accuser after seeing the Guardians of the Galaxy? If so, then consider dressing as Drax the Destroyer at your next costumed event with the fantastic Adult Drax the Destroyer Mask! If Drax the Destroyer was your favorite character in Guardians of the Galaxy, you may enjoy adding his knife to your Drax costume this Halloween! The Drax the Destroyer Dagger provides authenticity to your ensemble. After his family was slaughtered, Drax swore vengeance. He is very strong but has difficulty understanding metaphors. 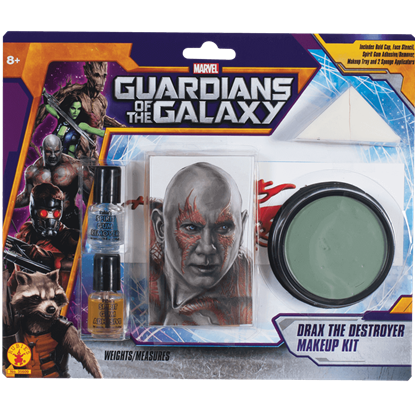 Use this Drax the Destroyer Makeup Kit to emulate this fearsome warrior from the film Guardians of the Galaxy. Let your child dress as a warrior in search of retribution! 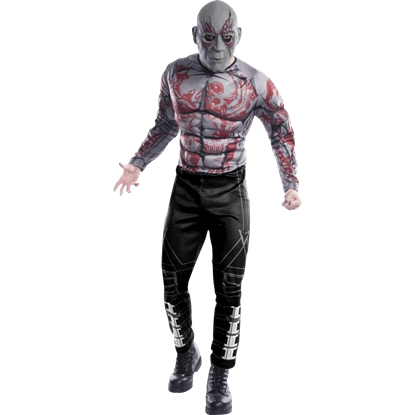 The Kids Deluxe Drax the Destroyer Costume looks great for role-playing vengeance against Ronan the Accuser or teaming up with the other Guardians of the Galaxy. Drax is a mighty warrior who is seeking revenge after his family is killed by Ronan the Accuser. Along the way, he joins forces with the Guardians of the Galaxy. 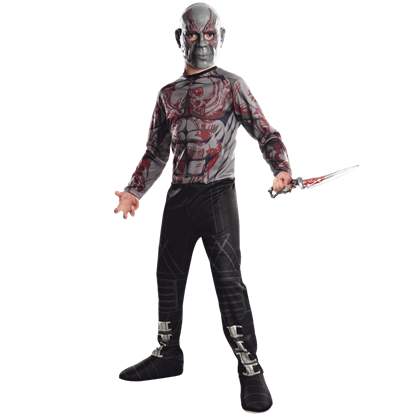 Your child will love wearing this Kids Drax the Destroyer Costume! Do your kids enjoy acting out Drax the Destroyer scenes from the Guardians of the Galaxy? 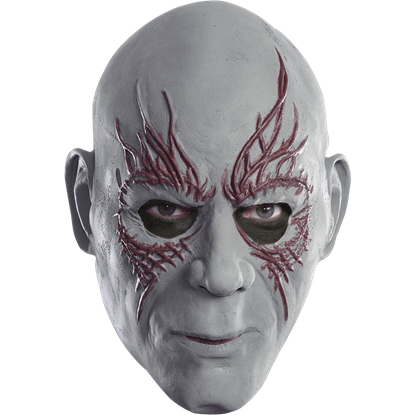 Then, they might enjoy dressing as Drax this coming Halloween with the Kids Drax the Destroyer Mask as the final touch of the ensemble! I am a subscriber of Superheroes Direct newsletter and I want to mention how much I love to see the new products you care not to mention the sales and promotions. Keep up the good work!